A historic summit in Australia has called for a new formal body to represent the nation's indigenous peoples in parliament. 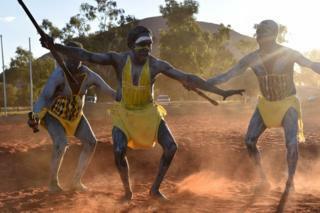 More than 250 indigenous leaders met in Uluru to discuss how to best recognise Australia's first inhabitants. Crucially, they rejected the idea of constitutional recognition - an idea that was criticised as merely symbolic. Instead the delegates called for a constitutionally enshrined "voice" in parliament and a path to a treaty. The statement - called the Uluru Statement from the Heart - came after three days of talks at the First Nations Convention. "Proportionally, we are the most incarcerated people on the planet. We are not an innately criminal people," it said. "Our children are aliened from their families at unprecedented rates. This cannot be because we have no love for them. And our youth languish in detention in obscene numbers. They should be our hope for the future," it said. "We seek constitutional reforms to empower our people and take a rightful place in our own country. When we have power over our destiny our children will flourish." The convention said it would only accept "substantive constitutional change and structural reform" that was not simply a statement of acknowledgment. "It will have a more practical impact on Aboriginal people's place in the democracy," Cape York leader Noel Pearson told the Australian Broadcasting Corporation. The statement called for a treaty and said a commission should be established to supervise the process and engage in "truth-telling about our history". Australia is the only Commonwealth country that has never signed a treaty with its indigenous people. The recommendations will be delivered to Australia's political leaders, who will decide whether to hold a national referendum. Mr Pearson said he hoped the referendum could take place within the next 12 months. The summit was scheduled to coincide with the 50th anniversary of a historic vote that allowed indigenous Australians to be included in a national census. Prime Minister Malcolm Turnbull and Opposition Leader Bill Shorten declined invitations to the meeting, not wanting to influence discussions. Tasmanian delegate Michael Mansell said he hoped the process would help end indigenous disadvantage in areas such as imprisonment, employment and education. "Hopefully in the next 10 years things can turn around for the better," he told the BBC. On Thursday, seven delegates from the states of Victoria and New South Wales abandoned the summit over fears it was focusing too much on constitutional recognition. "We as sovereign First Nations people reject constitutional recognition," Victorian delegate Lydia Thorpe told reporters. "We do not recognise occupying power or their sovereignty, because it serves to disempower, and takes away our voice." Why doesn't Australia have an indigenous treaty?